I logged into the third preview of Update 23 on Bullroarer test server this evening and perused the various changes that Standing Stone Games have made. For a lot of the “serious” LOTRO players, the focus of this latest build are the statistical changes to all the various classes. As I am not so au fait with this aspect of the game, I shall leave the matter until it is finalised then discuss it with my kinship who are more learned in these matters. My primary motivation for using the preview server is to get an advance look at any new region and to explore the environment. Standing Stone Games continue to do a sound job of realising the Third Age of Middle-earth and I enjoy the attention to detail they provide along with their adherence to the lore. One of the aspects of LOTRO that I’ve always enjoyed are the regional maps. 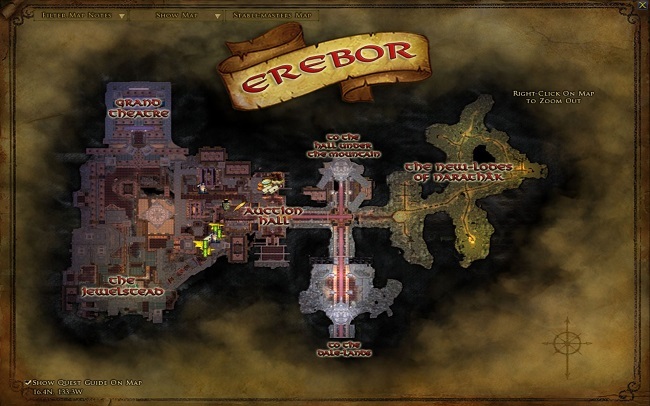 In this latest preview build, all maps for the new region of Ered Mithrin are now available and the temporary placeholders for Erebor and The Steel Keep have been removed.